“Hunger transcends all ethnic backgrounds and faiths,” said Rabbi Brian Glusman, the Marcus Jewish Community Center’s director of membership, engagement and community outreach. 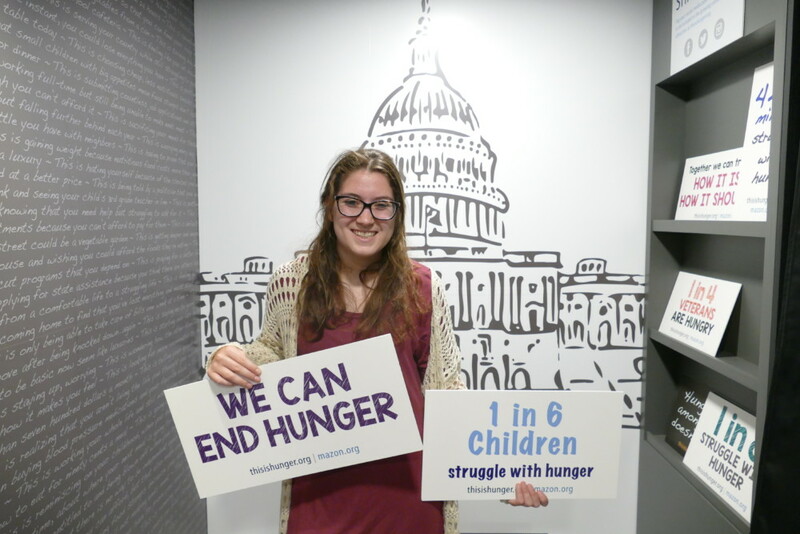 The Marcus JCC and co-sponsor Congregation Or Hadash raised awareness about food insecurity through the mobile installation “This Is Hunger,” presented by the nonprofit group Mazon: A Jewish Response to Hunger. Mazon means nutrition or food in Hebrew, and the nonprofit organization works to end hunger among people of all faiths in the United States and Israel. Hunger affects 42.2 million Americans, including 14.9 percent of Georgia households, according to Mazon. Some 1.8 million Georgians participated in the Supplemental Nutrition Assistance Program as of 2015. Food scarcity affects 13.1 million U.S. children and 5.7 million seniors, Mazon says. 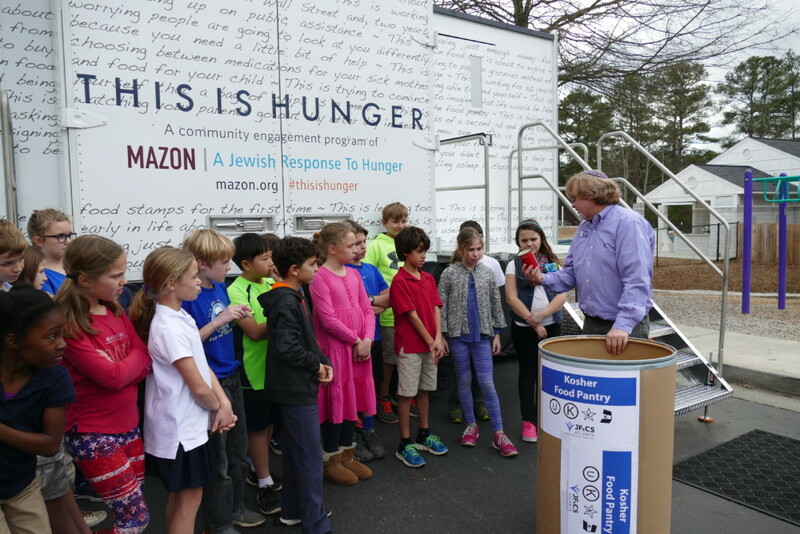 “This Is Hunger” was stationed at the JCC’s Zaban Park in Dunwoody on Wednesday and Thursday, Jan. 18 and 19, then stopped at Peachtree Christian Church on Jan. 20 and 21 and at Temple Sinai in Sandy Springs on Jan. 21. 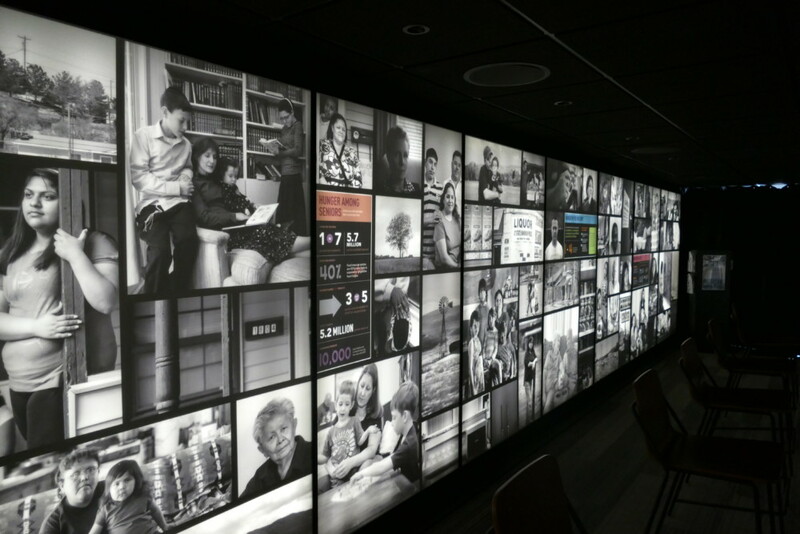 The exhibit aims to inform visitors through advocacy and engage them through action. A 14-minute audiovisual presentation introduces visitors to Americans affected by hunger, including a military veteran, a senior citizen and a millennial. “The stories are captivating because hunger is such a necessity, but we seldom hear about it,” Rabbi Glusman said. 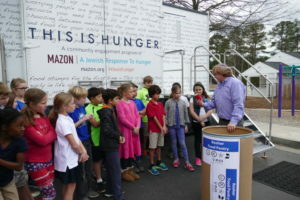 Rabbi Brian Glusman discusses hunger with elementary school children outside the “This Is Hunger” mobile exhibit. Juniors and seniors from the Atlanta Jewish Academy visited “This is Hunger” alongside students from the JCC’s after-school program. “It was incredible to see the diversity of people who wanted to view the exhibit,” Rabbi Glusman said, including Hindus, Muslims and Congressman Hank Johnson (D-Lithonia). Mazon and other nonprofit groups addressing hunger worry about budget cuts to SNAP. 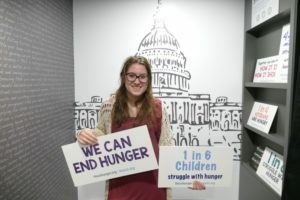 IPads at the Mazon exhibit presented a petition urging the Trump administration to preserve SNAP, and visitors were asked to work with schools to provide meals or take to social media (#thisishunger).